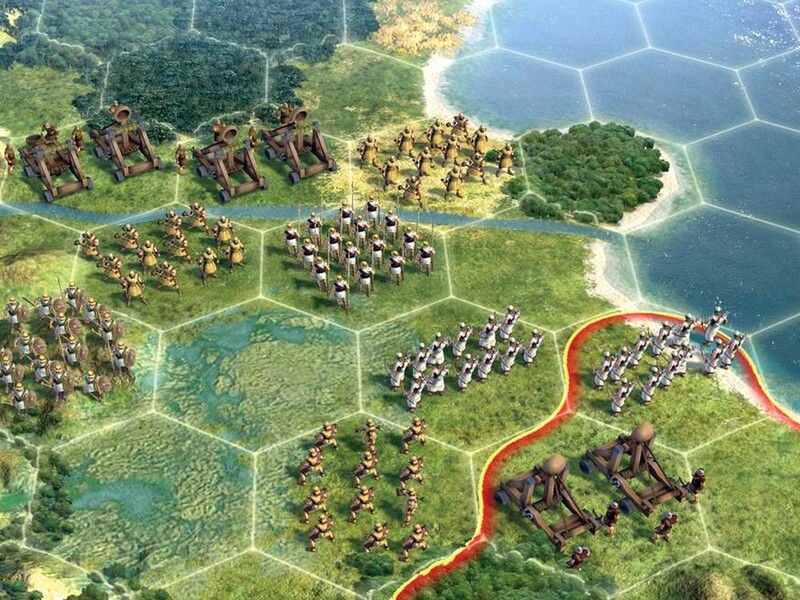 In Sid Meier’s Civilization V, the fighting is fussier than before, but the oversight of empire is easier than ever. Welcome to my world! Won’t you come in? Let me put your coat over here in this peninsula we never use. Have you met Catherine of Russia yet? Well, she’s nothing special — just like the rest of us. And that’s Belgrade over there. He’s the latest city-state I annexed. He was quite the little rebel for a while, spreading unhappiness absolutely everywhere. I had to build half a dozen coliseums to counteract his mood. But now he’s hard at work on a little project for me called the Sistine Chapel. All his resources are devoted to it, so he probably won’t be contributing much this evening. Yes, we used to practice Piety, but then we switched to Autocracy. I suppose I’m not as happy, but it’s much less expensive. I mean, who can afford religion in this economy? It seems like every time I turn around I’m spending money to update my military or expand a city or hurry along the construction of a new kind of power plant. No, no. Nuclear power is clean as far as I know. No pollution or anything. Certainly, some things aren’t eco-friendly. There’s no mining and farming in the same space, for example — though you’d think that eventually science would address that issue. But it’s on to the next advance in particle physics or whatever, and then along comes another military unit to buy. We do go to temple, but it’s just a “Temple,” not an actual religion like we had for differentiating ourselves back in the Civilization IV days. Now the only thing that distinguishes a German from an Egyptian is the color of their units — not that I’d judge anyone based on that! Of course we do have our little squabbles. It’s rather tedious, really. In the old days, we would save up our forces and then attack. Now there’s no lumping our army together. I long for those days of cumulative firepower — four big blow-ups were much more efficient than six smaller attacks. Besides, I really don’t understand how an entire city can fit into a single space but not two squadrons of foot soldiers. Now our battles are these drawn-out affairs that sprawl all over the map. That’s why this place is such a mess. I try to run a neat world. But things get crowded, particularly with all the names of those Aztec cities with their ferocious Xs, Ts and Zs taking up space. And with all the individual military units, there’s so much clutter it gets hard to see where you’re standing. Not to mention the workers always hacking into some fluffy forest or chiseling roads across the landscape. Civilizing is really such an unattractive process. Sometimes it just makes me want to stop the world and hop right off. THE GOOD: Civilization V has streamlined the way that cities operate, allowing them to expand organically and eliminating the need to micromanage individual citizens. THE BAD: Scientific progress leads to military development more than diplomatic or cultural growth, making most sessions of Civilization V a combat-mired mess by mid-game. THE BOTTOM LINE: In Sid Meier’s Civilization V, the fighting is fussier than before, but the oversight of empire is easier than ever.